In a perfect world, teaching compassion in school would be a high cultural priority and people with disabilities would be valued for what they can contribute to the group. They would not be shunned or set aside. But, I think in our culture, at least in school, teaching competition is more highly valued. And leaving out the kid who is different is, well, it’s just what people do to “get ahead” or win. When I was little, I had an underlying immune problem which, it seems, was part of what was causing my autism. My mom and dad and I took many trips from Northern to Southern California, so that I could get my doctor-prescribed IVIG infusions which helped to shift my core health in a positive direction. As I got healthier, I was more able to communicate, learn, and relate. I missed a lot of school back then. And forming friendships was particularly challenging. That year, I was in an inclusion setting in school. I had started to practice soccer with my first grade classmates after school on a “team” that was loosely formed by the dads. A couple of the boys were already awesome athletes. But, the majority of us were just six-year-old boys running around on a field. 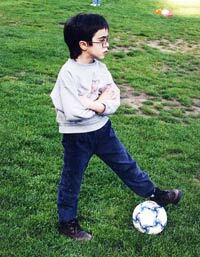 Even though I am not naturally drawn to team sports, I loved being out there, kicking the ball. And, sometimes, I kicked it in the wrong direction. Oh, well…. One kid just sat down in the field. Our nickname for him was Ferdinand the Bull, because in the cartoon about Ferdinand the Bull, all Ferdinand wanted to do was to sit in the field and smell the flowers. This boy’s dad was one of the team’s coaches. But, his dad just let his son do his thing. The team seemed to play okay, even if this boy sat it out…in the middle of the field. One of the times I was off at IVIG (which was every six weeks and which was usually a three-day trip), everything changed. In order to use the field, the City informed the dad-coaches that they had to file papers with the City and formalize the team. They left my name off the team list. When I got back, they told my parents it was “too late” to add me. I couldn’t play or practice soccer with them anymore after school. It didn’t have to do with my ability to kick a ball or run or even about any lack of desire to be part of the group. I wanted to be there. These were my classmates and I was the only one not on the team. “Ferdinand” was included on the team; he didn’t even want to be part of it. This was the first time I became aware of this kind of dismissive behavior towards children like me. This was the first time I became aware of this kind of dismissive behavior towards children like me. I felt sad. I don’t know why they didn’t think it would affect me. Of course, it did. My parents quickly sought out other activities for me for after school, so that I wouldn’t notice. But I did notice, especially when we drove by the field. My mom stopped driving by the field. Now, I’m older. Because of my experience, my tendency is to welcome and include others. It makes me happy to hear that people like The Rocket Family Chronicles because any show is a team effort and I’m part of this team. I sometimes am the Production Assistant, moving boxes, setting up the camera and the lights. Sometimes, I’m a Cameraman; I’ve shot parts of the episodes. Mostly, of course, I’m acting in front of the camera which I love and is thrilling for me. But, more than this, I love knowing that what I’m doing is inspiring others kids on the Spectrum to know that they can one day be valued members of a team, too. Sam Rubin plays Rocket on The Rocket Family Chronicles on The Autism Channel.